The restyled Audi A4 will be offered in a wagon bodystyle. DETROIT -- Audi has revealed a facelifted version of the A4 that will hit showrooms in Europe in January. U.S. consumers will get the restyled A4 next June or July, marketed as a 2013 model. New front styling with more curvaceous headlamps with reworked LED running lamps now appearing as a continuous band. More styling contours on the hood. The adoption of a new six-corner single-frame grille that is painted gray on four-cylinder versions and black on six-cylinder models. A restyled bumper with trapezoid-shaped fog lamps. At the rear there are new taillamps with altered LED graphics mirroring those of the headlamps. A new rear bumper with a more-prominent valance panel with twin chrome tailpipes. Inside, Audi offers new steering-wheel designs, higher-quality dashboard and center-console trim, revised switchgear and alterations to the optional MMI navigation-plus system. The highlight among the A4's gasoline engines is a new 1.8-liter four-cylinder TFSI, which is used in the A5 Sportback in Europe. With 168hp -- 10 hp more than in its predecessor -- the new engine returns 42 mpg on the European test in standard front-wheel-drive, six-speed manual guise. The new engine is being considered for sale in the United States. 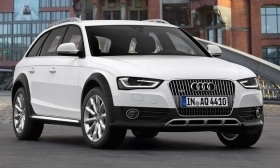 In Europe, the A4's base gasoline engine remains the older 1.8-liter four-cylinder unit with 118 hp. It is joined by the 2.0-liter four-cylinder TFSI engine, rated at 211 hp, used in North America. Above it is a supercharged 3.0-liter V6 that endows the all-wheel-drive S4 with 328 hp. On the diesel side, Audi has modified its 2.0-liter four-cylinder with what it describes as a pendulum-type absorber in the dual-mass flywheel -- in some but not all variants. However, there is no word on whether it will be offered in the U.S. market. The diesel now comes in no less than five different states of tune: 118 hp, 134 hp, 141 hp, 161 hp and 175 hp. Two 3.0-liter, six-cylinder turbodiesel engines are also available in Europe: 204-hp and 245-hp versions. With a new electromechanical steering system now standard across the lineup along with automatic stop/stop, brake-energy recuperation and ancillary components that only draw energy when required, the new A4 is claimed to be on average up to 11 percent more fuel efficient than its predecessor. A six-speed manual is standard on all front-wheel-drive models. Options include Audi's long-running continuously variable transmission, the Multitronic, as well as a seven-speed dual-clutch unit called the S-tronic, but it isn't available in combination with all engines. Quattro all-wheel drive is available in most models. With the V6 engines, it adds a sports differential with torque vectoring for added traction.